When we were at the Bear Lake Monster Swim a couple weeks ago, we noticed a guy with a kayak cart made out of PVC. What a great idea! When I got home, I looked up some plans on Instructables and Sabrina bought me all the materials for my birthday. Last night I finally got around to putting it together. My main kayak is a Lifetime Manta sit-on-top and I customized the plans I found online to specifically fit this kayak. I love this kayak because it has plenty of room for my whole family and, when I am paddling for swimmers, it has plenty of space for gear and feeds and for me to stretch out. The only drawback is that it is big and heavy and really awkward to carry. This year was especially tough at the Great Salt Lake Open Water Swim as Mark and I carried it 1/2 mile down a hill, across rocks, and through thick mud. With this cart, the kayak is easier to move with one person than it is with two people carrying it. Here is the link to the instructions I referred to, and modified. Some of the parts needed to build a kayak cart. Build the wheels:Drill progressively larger holes into the center of the cleanout plugs. You will end up with a 1/2 inch hole and your bolts should slide through. The wheel assembly should go like this: bolt, washer, wheel, washer, clean-out plug. After you fit these pieces together, you can fill in the square space of the clean-out with hot glue to keep water, sand, etc, from getting inside. Finish off the wheel assembly with another washer and two bolts. Optional hot glue to keep water, sand, etc out. Before you glue the pieces together, dry fit them and put it under your kayak to make sure everything looks good. If needed, make modifications before you glue. At this point you can prime and glue the pieces together. You can also leave some of the connections un-glued so that you can take the cart apart for storage. Cut the pool noodle into 10" sections with the bread knife and then cut down the length of one side so that it will fit over the PVC bars. Fit the pads onto the cart and secure with zip ties (optional). 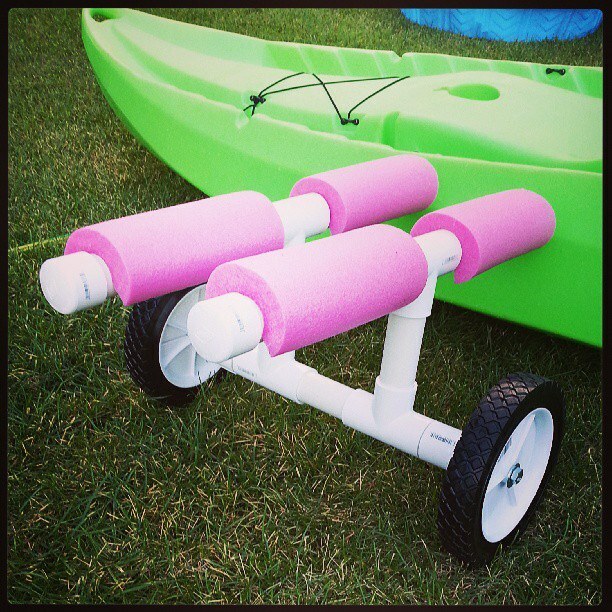 Section of pool noodle "pad"
Enjoy the hassle free transport of your kayak!